M T D D e c e m b e r 2 0 1 8 46 2 0 1 8 S E M A S h o w touchless alignment inspection system, Quick Check Drive. Both systems are connected with HunterNet, the company's smart technology platform. HunterNet automatically displays digital inspection findings on a Flightboard screen, allowing customers to see their vehicle's inspection results first-hand. All of these products were integrated in Hunter's booth, so attendees could see the seamless connectivity in action each time a car was driven over the Quick Check Drive system. Hunter also demonstrated its partner- ship with TCS Technologies to enable shops to integrate alignment machine results with work orders and a customer's record using TireWorks HD soware. In addition, service providers can access alignment results from any location. e soware offers an optional TCS Live Feed feature that allows customers to view their service and alignment history online 24/7. "We are excited to tie alignment results into the point of sale to help shops be more productive and provide a better customer experience," said Alan Hagerty, product manager. Hunter also introduced a HunterNet feature that transmits connected equipment results to shops. Called Push Reports, the feature eliminates the need to pull informa- tion manually, which creates opportunities for service providers to make immediate data-driven decisions. "Imagine getting a report on how productive your store is being with its alignment and balanc- ing equipment," said Madeline Triplett, advertising development manager. 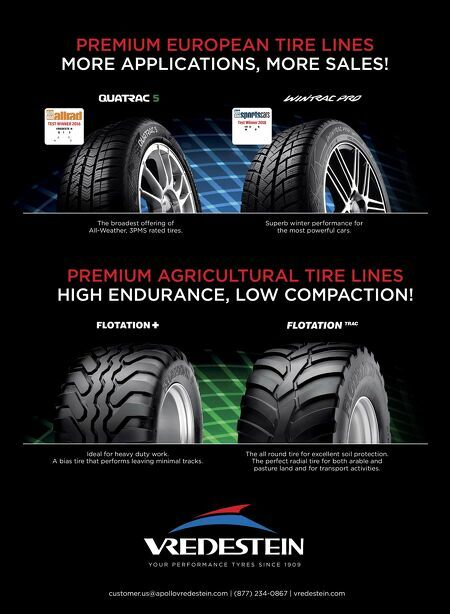 A wide range of tire and wheel servicing equipment, including the new Revolution The members of the Specialty Equipment Market Association (SEMA) Wheel & Tire Council Hall of Fame exhibit "the best in the industry." And for 2018, the group gave that honor to only one man: the late Wayne Williams. He was known as a writer — and monthly columnist for Modern Tire Dealer — as well as a salesman, design- er, husband and father, said Gregory Parker, chairman of the Wheel and Tire Council. He also founded ExSell Marketing Inc. And he exuded the char- acteristics of the council's Hall of Fame members, with his "creativity, dignity, integrity, (and) being industrious." Park- er said Williams enhanced the status of the industry "while significantly contributing to its growth, progress and profes- sionalism." Williams died July 19. Among all of those words, it was Williams' creativity that stood out. Parker said it was as if Williams was nearly too creative, because "he had so many creative ideas, so much zeal for these ideas, so much passion for every idea that it was hard to choose which great idea to put into effect." Parker said there are times leaders have to know when to set aside good ideas to reach for the great ones. "I truly be- lieve our hall of fame inductee tonight lived that principle more than most." Williams was committed to doing things the right way, and delivering innovating solutions to make business better for everyone. "He was a visionary, a damned hard worker and a friend." Williams' wife Tia and his son Ryan attended the Wheel & Tire Council event at the 2018 SEMA Show. Ryan Wil- liams said it would have been he and his dad's 16th show they attended together. He said his dad's "passion for the wheel and tire after- market (business) will forever be remembered" by anyone he worked with. Williams outfit- ted all of his vehicles with cus- tom wheels, and would stand behind someone else's tire counter to sell tires — just for fun. He loved to sell a good tire at a great price, and pushed new ways to move units. The younger Williams also shared one of his father's trademark tips: "You always said communication is 90% of everything, and the last 10% is just showing up." 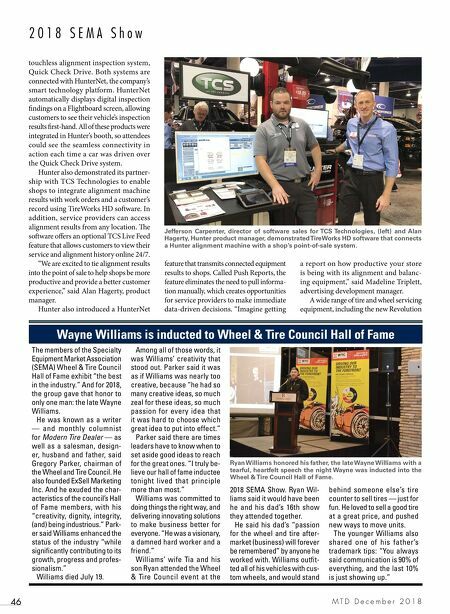 Wayne Williams is inducted to Wheel & Tire Council Hall of Fame Ryan Williams honored his father, the late Wayne Williams with a tearful, heartfelt speech the night Wayne was inducted into the Wheel & Tire Council Hall of Fame. Jefferson Carpenter, director of software sales for TCS Technologies, (left) and Alan Hagerty, Hunter product manager, demonstrated TireWorks HD software that connects a Hunter alignment machine with a shop's point-of-sale system.